Merci beaucoup à tous ! Many thanx to all friends ! try until you succeed ! it works !!!! merci Eric ! thanx Eric ! - First of all, can you explain to us what is Seamless3d ? A modeller ? a 3D chat platform ? Most of the time and energy invested in developing Seamless3d has by far been spent on making it a modeller. The 3d chat component can be ignored by modellers who are only interested in using Seamless3d to create content for another 3d platform. Seamless3d has multi user capabilities because it adds very little weight and complexity to the modeller and because very little time from me was needed to add it. 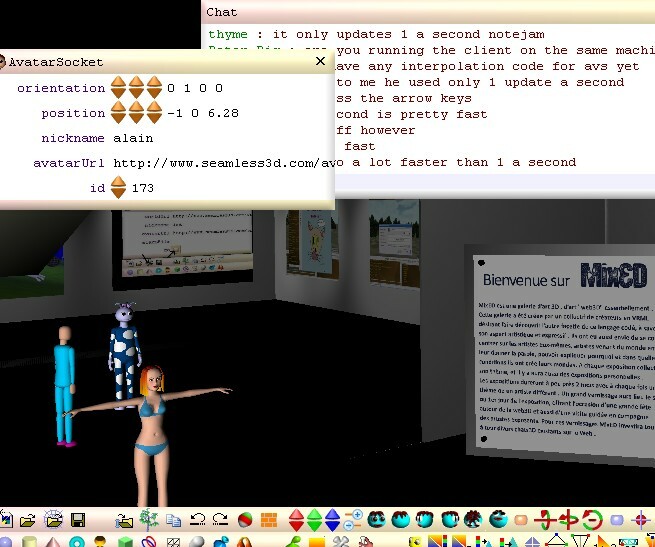 In the future I may have the 3d chat client a separate program to the modeller. Seamless3d is very well suited to having multi user capabilities because it is an open technology, it has its own native 3d modelling language that supports powerful procedural scripting and seamless3d performs efficient animation in real-time. Seamless3d files are typically significantly smaller than VRML/X3D files which makes them net friendly. Although I have done very little work on the multi user component, it does support chat, avatars, gestures and the ability to move and orientate one’s avatar which are the essentials for a 3d chat platform. 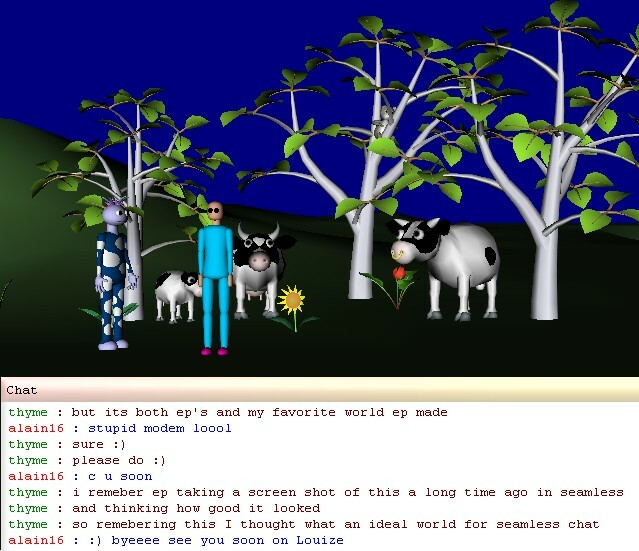 As a world viewer it is fair to say Seamless3d’s capabilities are minimalist but for meeting up with friends to chat and show off each others avatars in nice surroundings, it has all one needs. In regard to quality & sophistication, Seamless3d avatars are second to none. 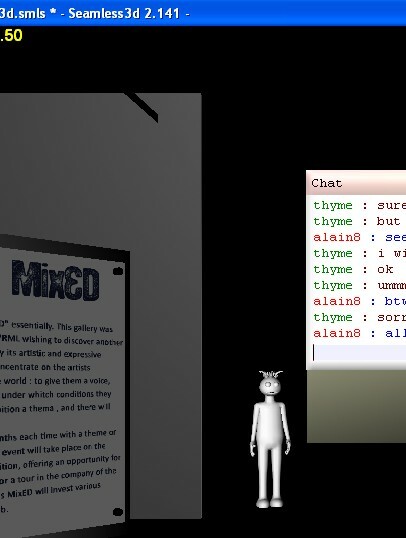 …do you really want that people use your modeller to chat , Thyme ? or use your chat to model ? or both ? Seamless3d supports many different 3d chat platforms. However I am not aware of a 3d chat platform that has Seamless3d’s capabilities and which has the 3d, chat and server components all open source. I can see benefits in having it so that when someone moves an object or changes the colour or even the shape, the changes are shared with others in the world in real time but I am not so sure it would be a good idea to share all of Seamless3d’s modelling functionality with everyone else in the world. For example if two or more users tried to edit the scene tree at the same time things could get complicated and ugly. Shared modelling in real-time has not been the driving force behind adding multi user capabilities but this idea could be approached in many different ways and I can imagine how it may be useful as a teaching aid. I will give this idea more thought. - When did you start work on Seamless3d and why did you decide to create it ? 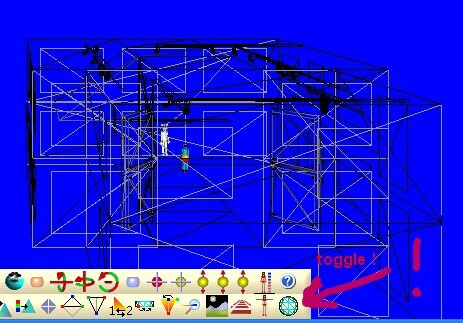 I began 3d modelling by writing code to generate shapes in 1996. After learning how to write an algorithm to generate a sphere I soon discovered the joys of adding code to the algorithm to deform the sphere. This resulted in creating more complex and interesting shapes. Later I wanted to be able to fuse these shapes together in such a way that there would be a smooth continuous curved surface from one shape to the next. This lead to the development of the 3d modelling library I called Seamless3d which was made freely available to the public in 2001. 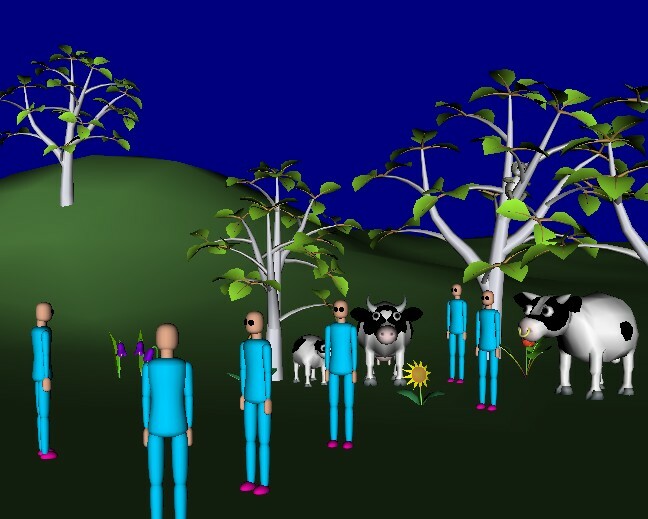 The Seamless3d library was used for making the trees and deer on techuelife island and the first range of Seamless3d/Techuelife avatars. 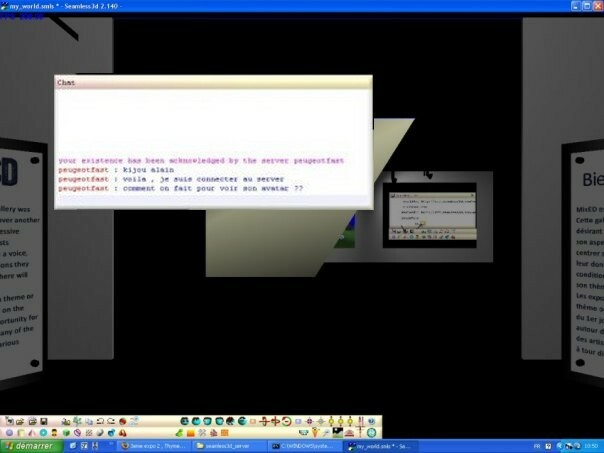 In January 2003 a GUI based version of Seamless3d was developed which allowed the artist to utilise key features of the Seamless3d library without needing a C++ compiler in order to use them. It is important that Seamless3d has no secrets in order to be an open design. The Seamless3d modelling language is designed specifically for 3d modelling. It allows the user to perform task like generating meshes from nurbs patches, fusing nurbs surfaces together, colouring, texture mapping, transferring ownership to different parts and joining vertices together. Seamless3d performs all of these tasks sequentially but because they are done so fast, to the user it feels like they are done in an instant each time a control point is dragged or when a node’s field is changed. Because Seamless3d performs its tasks sequentially it is a procedural modeller but it also supports non procedural modelling techniques too. Procedural modelling requires more care from the artist but it offers a lot of power and allows the artist to in effect go back in time and make changes to their work without having to start from scratch. The Seamless3d modelling language has a lot in common with VRML but it is designed to be procedural, more script friendly and more compatible with C++ which is the most commonly used language for writing 3d applications today. As a 3d modelling language, Seamless3d is more advanced than VRML or X3D for tasks like creating seamless animated models using polygon independent surfaces. Because the Seamless3d modelling language is a procedural language and does not defer all events, it is more conventional by design than X3D. This should enable it to draw more support from a wider range of different 3d applications. - What programming language have you used to develop Seamless3d ? - Are you still working on it ? Yes. Seamless3d has been in rapid development since its beginning (and before this time) to the present day. To get some idea how much work has gone into developing seamless3d over the years, look at all the version announcements. There have been 141 different versions of Seamless3d uploaded since January 2003. Some versions are simple bug fixes but most have had weeks if not months of intensive full time work put into them. Most of my effort has centred on making Seamless3d easier to use without sacrificing the artist’s freedom. - What will be the big improvement for Seamless3d in the future ? I would like to develop its script compiler further and add a few more features but because Seamless3d has so many features now I wonder these days that what Seamless3d needs more than anything else is for me to stop adding new features to allow it to stabilize With all the changes that have taken place over the years most don’t realise just how easy seamless3d is to use now. One problem with rapid development is, tutorials that take a lot of time to write soon become outdated or completely irrelevant. I think developing a system for making avatars could be very good for Seamless3d. I have been thinking about creating a specialised avatar program that will have a very simple interface but the application will use Seamless3d technology under the bonnet . The user will only need to specify proportions for the different body parts and will be able to select different noses, mouths and eyes. My guess is such a program would soon become very popular if it creates an original style of avatar that most find appealing and if it supports popular 3d chat platforms. This avatar program would not replace the Seamless3d modeller, it should compliment it if the specialised avatar program generates files that can be loaded by the general purpose Seamless3d modeller for more advanced editing. - Would you like to make something commercial with Seamless3d or do you want to keep it free till the end ? I am not against anyone including my self from using Seamless3d technology to make money, however I do not want to jeopardise its chance of success by charging money for the modeller. I want Seamless3d to always remain freely available to the artist. I think it is important that Seamless3d technology remains open so that those who invest time and energy in it feel secure about its future. - Is it hard to work alone on Seamless3d ? Yes but I have not had to fight anyone else’s political persuasions in designing Seamless3d because I have total freedom over the design. When you consider that the most successful computer languages have been designed by individuals rather than teams, I see little point in compromising Seamless3d’s design by subjecting it to a committee. I think there is a big misconception that you need a committee to have freedom in developing languages. 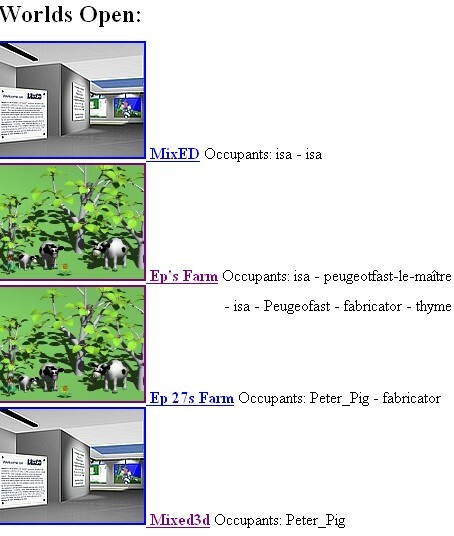 The same way I have used concepts from a number of different languages any language designer is free to use Seamless3d’s concepts in their language. - Would you like some help and what kind of help do you need ? I get very little feedback from experienced users so perhaps the best way anyone can help, is to use Seamless3d to create art and talk about their experience on a public forum. To make art one has to make time for it but never make it a chore. - Do you continue to build some 3d worlds or are you working only on Seamless3d ? Because of the time spent developing Seamless3d I have had very little time to make worlds. I think the last substantial world I made was my light house world in December 2004 which was made using Seamless3d with very little help from a text editor. I have spent more time this year modelling avatars than I have in a long time and I hope now that Seamless3d has advanced to where it is, I can continue to spend much more of my time using Seamless3d instead of only developing it. - If you have a dream for VRML or 3d, What is it ? I would love to see more original animated characters and 3d movies made. I would like to see the same amount of time and energy invested by people in developing drawing and painting skills, invested in developing 3d modelling skills. I don’t see why dragging a control point is any more challenging technically than using a pencil or a paint brush. I think of how so many children from an early age are encouraged to draw or paint but how many are encouraged to play with a 3d modeller like Seamless3d? Just imagine all the great art the world would be able to enjoy if more people dabbled in creating 3d content and shared it on the net. 3d graphics is such an exciting medium because it allows the artist so many different possibilities. The same models an artist makes for a virtual reality world can be used for a computer game or for creating movies that tell a story. With YouTube anyone can now easily get their 3d animated stories exposed to a wide audience. It is all now down to the artist to make the content. - What do you think about the situation of Blaxxun ? When Blaxxun was declared bankrupt in 2002 I can remember meeting Peter Graf (one of the Blaxxun founders who developed the Blaxxun server) in the Blaxxun home community. He told me frankly that Blaxxun was dying. Everyone knew the Blaxxun community server was soon going to be pulled and cybertown’s future was uncertain. It was this event that first prompted me to develop a 3d chat viewer which I called the Techuelife Viewer. I knew next to nothing about servers back then but I had been developing a 3d modeller (an early GUI version of Seamless3d) which I used to make the 3d client. It was not long before I had a very simple server and 3d client working for a number of testers from the Blaxxun community. After the Blaxxun home community plug was pulled it was soon plugged back in, however this did not restore full confidence in Blaxxun’s future, especially since the founders were no longer working for Blaxxun. I wanted to continue to develop the Techuelife Viewer but I was also at a very exciting stage in Seamless3d’s development and because the viewer was mostly Seamless3d technology anyway, I decided to develop the viewer through developing Seamless3d. Since 2002 there have been times when the Blaxxun home community server has been down for weeks and it has been during these times I have resumed work on Seamless3d chat so it has been developed on and off over the last few years. Because Seamless3d chat is a non propriety open source platform, it is immune from going bankrupt or being taken over by a company that locks up further development on it. - For you, what is the best alternative to Blaxxun and why ? When comparing 3d chat platforms one has to take many different aspects into account. I think it would be unfair for me to state which is the best 3d platform. I can not really compare Second Life to Blaxxun from experience because of my slow dialup connection. How compatible to Blaxxun is it ? Does it restrict artistic freedom ? Does it allow the user to upload their own content free of charge ? How popular is it ? Is the animation smooth and free of periodic jerks ? Does it frequently crash for many ? Is it dependent on some component that does not have a future ? Does it let you use your modeller of choice ? Does it support text to speech ? Is the platform open source, both server and client ? If it is open source is it dependent on something that’s is not open source ? If it is open source how much freedom does the licence give ? Does it support polygon independent surfaces that can utilise hand edited poly maps for optimization ? Is the underlying technology designed to be versatile and is it likely to draw support from a wide range of applications ? Does the platform have working examples to prove its capabilities or does it rely on promise ? I am not aware of a 3d platform that will come out best on every one of these issues. Tout d‘abord peux tu nous expliquer ce qu’est Seamless3d ? un modeleur ? une plateforme 3d ? La plupart du temps et de l’énergie investis dan le développement de Seamless3d a été de loin passé à en faire un modeleur. La partie chat http://www.seamless3d.com/tut/chat/index.html peut être ignorée des modeleurs qui souhaitent seulement l’utiliser pour créer pour d’autres plateformes 3d. Seamless3d a des capacités multi users parce que cela ajoute peu de poids et de complexité au modeleur et parce que je n’ai pas eu besoin de beaucoup de temps pour l’ajouter. Dans l’avenir je voudrais séparer le programme chat client du modeleur. Seamless3d est très adapté pour avoir des capacités multi users parce que c’est une technologie ouverte, il a son propre langage pour la conception 3d, lequel supporte de puissantes procédures d’écriture et il fait de l’animation en temps réel. Les fichiers Seamless3d sont significativement plus petits que ceux du VRML/S3D ce qui les rend conviviaux. Bien que j’aie peu travaillé sur le composant multi user, il comprend un chat, des avatars, des gestes et la capacité de déplacer et orienter son avatar, ce qui est l’essentiel pour une plateforme chat 3d. En tant que viewer, il est juste de dire que les possibilités de Seamless 3d sont minimales mais pour se rencontrer entre ami pour discuter et se montrer mutuellement des avatars dans un environnement agréable il a tout ce qu’il faut. Du point de vue de la qualité et de la sophistication, les avatars Seamless3d sont mieux que rien. Il y a beaucoup de modeleurs et beaucoup de plateformes aujourd’hui, veux tu réellement que les gens utilisent ton modeleur pour chatter Thyme ? ou utilisent ton chat pour créer ? ou les deux ? Seamless3d supporte différentes plateformes de chat. Cependant je ne connais aucune plateforme 3d qui ait ses capacités et qui ait les composants 3 chat et serveur, tous en open source. J’y vois l’avantage que lorsque quelqu’un déplace un objet ou change sa couleur ou même sa forme, les changements sont partagés par les autres sur le monde en temps réel, mais je ne suis pas sur que ce serait une bonne idée de partager toutes les fonctionnalités avec tous les autres. Par exemple, si deux ou plusieurs utilisateurs essaient d’éditer l’arborescence au même moment, les choses pourraient devenir compliquées et désagréables. Partager la création en temps réel n’est pas ce qui m’a poussé à ajouter les possibilités multi users mais cette idée pourrait être abordée de plusieurs façons différentes et je peux imaginer que cela pourrait être utile comme instrument pédagogique. J’y penserai davantage. Quand as-tu commencé à travailler sur Seamless3d et pourquoi as-tu décidé de le créer ? J’ai commencé la 3d en écrivant du code pour fabriquer des formes en 1996. Après avoir appris à écrire un algorithme pour fabriquer une sphère, j’ai vite découvert le plaisir d’ajouter du code à l’algorithme pour la déformer. Cela aboutit à la craton de formes plus complexes et plus intéressantes. Plus tard j’ai voulu fusionner ces formes en les reliant par des surfaces continues courbes et lisses. Cela mena au développement de la bibliothèque 3d que j’appelai Seamless3d et qui fut librement accessible en 2001. La bibliothèque Seamless a servi pour fabriquer les arbres et les cerfs de techuelife island et la première série de Seamless3d/Techuelife avatars. En janvier 2003 une version de Seamless3d permettait aux artistes d’utiliser les dispositifs principaux de la bibliothèque de Seamless3d sans avoir besoin du compilateur de C ++. Quelle est la technologie de base développée pour Seamless3d ? Si ce n’est pas un secret bien sur. Il est important de dire que Seamless3d n’a pas de secrets et veut être de conception ouverte. Le langage Seamless est conçu spécifiquement pour la création 3d. Il permet aux utilisateurs des taches comme générer des maillages, des « nurbs », fusionner ensemble des surfaces, colorer, texturer, transférer les propriétés et joindre ensemble les sommets. Seamless3d réalise toutes ces taches de manière séquentielle mais, parce qu’elles sont faites très rapidement l’utilisateur a l’impression qu’elles se font dans l’instant ou un point est déplacé ou quand un nœud est modifié. Du fait que Seamless3d réalise ces taches par séquences c’est un modeleur procédural mais il supporte aussi des techniques non procédurales. Le modelling procédural demande plus d’attention à l’artiste mais il offre beaucoup de puissance et permet de revenir en arrière et de modifier son travail sans avoir à partir du début. Le langage Seamless a beaucoup en commun avec le VRML mais il est conçu pour être procédural, accepter plus facilement les scripts et plus compatible avec C++ qui est le langage le plus courant aujourd’hui pour les applications 3d. En tant que langage Seamless3d est plus avancé que le VRMl ou X3D pour des travaux comme créer des modèles animés, utilisant des surfaces polygonales indépendantes. Parce qu’il est un langage procédural qui ne reporte pas tous les événements, il est plus conventionnel par nature que X3D. Cela devrait lui permettre de tirer plus d’appui d’un plus grand éventail de différentes applications. -Quel langage de programmation utilises-tu pour développer Seamless3D ? - Travailles-tu encore dessus ? Oui. Seamless3d a toujours été en développement rapide depuis ses débuts judqu’à présent. Pour avoir une idée du travail qui a été fait au fil des années regardez le nombre de versions différentes. Il y a eu 141 versions différentes mises en ligne depuis 2003. Certaines versions sont de simples corrections de bugs mais certaines sont le fruit de semaines , pour ne pas dire de mois , de travail intensif . La plus grande part de mes efforts est centrée sur la volonté de rendre Seamless3D facile d’utilisation sans sacrifier la liberté de l’artiste . - Quelle sera la plus grande amélioration de Seamless3D dans l’avenir? Je voudrais développer ses scripts de compilation et ajouter quelques autres fonctions , mais comme seamless3D a beaucoup de fonctions , je me demande maintenant si ce que réclame seamless3D plus que tout ce n’est pas que je cesse d’ajouter des fonctions , pour lui permettre d’être stable . Avec tous les changements qui ont été faits au fil des années beaucoup de gens ne réalisent pas combien seamless3D est plus facile à utiliser maintenant . Le problème avec un développement rapide c’est que les tutoriaux , qui sont longs à écrire ,sont rapidement dépassés. voires devenus faux . Je pense que développer un système pour faire des avatars serait très bien pour seamless3D . J’ai pensé à créer un programme spécialisé pour les avatars , avec une interface très simple , mais avec la puissance de seamless3D. L’utilisateur n’aurait qu’a spécifier les proportions des différentes parties du corps , il pourrait selectionnes différents nez , bouches , yeux . Mon désir serait qu’un tel programme pourrait devenir populaire en créant un style orignal d’avater qui pourrait être supportés par différents plateformes de chat 3D . Ce programme ne remplacerait pas le modeleur seamless3D , il le complèterait et les fichiers pourraient être ouverts par le modeleur dans un mode avancé . .
- Veux -tu faire quelque chose de commercial avec seamless ou bien vas -tu le laisser gratuit jusqu’à la fin ? Je n’ai rien contre le fait que certains se servent de moi en utilisant la technologie de seamless3D pour faire de l’argent cependant je ne veux pas compromettre ses chances de succès en le monneyant . Je veux que seamless3D reste librement accessible aux artistes. Je pense que c’est important que seamless3D reste open de manière à ce que ceux qui y investiront du temps et fde l’énergie soient assurés quant à son avenir . - C’est dur de travailler seul sur seamless3D ? Oui mais je n’ai eu à me battre contre aucune intervention de qui que ce soit en faisant seamless3D , parce que j’ai une liberté totale sur ce que je fais . Quand vous voyez que la plupart des langages informatiques ont été fait par des individus plutôt que par des équipes je vois peu de chance que seamless3D puisse être compromis par un comité . . Je pense que c’est un grand malentendu de penser avoir besoin d’un comité pour être libre de développer un langage . De la même façon que j’ai utilisé les concepts d’un certain nombre de langages , n’importe quel programmeur est libre d’utiliser les concepts de seamless 3D pour son propre langage . - Aimerais -tu avoir de l’aide et quelle sorte d’aide ? Je reçois peu de feeback de la part des utilisateurs et peut-être que la plus grande aide qu’ils pourraient apporter c’est d’utiliser seamless3D pour créer et de dire leur expèrience sur un forum public . Pour faire de l’art, il faut prendre le temps , mais jamais en faire une corvée. - Est-ce que tu continue à faire des mondes 3D ou travailles-tu uniquement sur seamless3D ? A cause du temps passé à developper seamless3D j’ai peu de temps pour faire des mondes . Je crois que le dernier monde substanciel que j’ai fait c’est celui pour mon phare en Decembre 2004 , utilisant seamless3D avec un peu d’aide d’un éditeur de texte . J’ai passé davantage de temps cette année à modeler des avatars que j’avais depuis longtemps , et j’espère maintenant que seamless3D a bien avancé que je pourrai passer plus de temps à l’utiliser qu’à le developper . - Si tu avais un rêve pour le vrml ou la 3D , ce serait lequel ? Je voudrais voir davantage de peronnages animés originaux et la réalisation de films en 3D. dessin et la peinture le soit aussi dans la modélisation 3D. Je ne vois pas en quoi en faire glisser un point de contrôle est plus difficile techniquement qu’utiliser un crayon ou un pinceau. combien sont encouragés à jouer avec un modeleur 3D comme Seamless3d? Imaginez tout l’ art dont le monde serait en mesure de profiter si davantage de personnes s ‘investissaient dans la création de contenu 3D et le partageait sur le net. Le graphisme en 3D est un moyen passionnant car il offre à l’artiste tant de possibilités différentes. Les mêmes modèles que l’artiste fait pour un monde de réalité virtuelle peuvent être utilisés pour un jeu sur ordinateur, ou de créer des films qui racontent une histoire. Avec YouTube tout le monde peut maintenant avoir facilement ses histoires enanimation 3d exposées à un large public. C’est maintenant à l’artiste de réer le contenu. - Que penses-tu de la situation de Blaxxun ? Quand Blaxxun a été déclarée en faillite en 2002 je me souviens avoir rencontré Peter Graf ( l’un des fondateurs Blaxxun qui a développé le serveur Blaxxun) dans la communauté Blaxxun Home. Il m’a dit franchement que Blaxxun était en train de mourir. Tout le monde savait la communauté Blaxxun serveur allait bientôt être arrêtée et l’avenir de Cybertown était incertain. Cela a été l’événement qui m’a d’abord incité à développer une visionneuse 3D chat que j’ai appelé Techuelife Viewer. Je ne savais presque rien sur les serveurs à l’époque mais comme j’avais élaboré un modeleur 3D (une première version graphique de Seamless3d) je l’ai utilisé pour faire le client 3D . C’était peu avant que j’aie un très simple serveur et client 3D pour travailler avec un certain nombre de testeurs de la communauté Blaxxun. Après la communauté Blaxxun a été “rebranchée” et de retour dans, mais on n’avait plus la même confiance dans l’avenir de Blaxxun, d’autant plus que les fondateurs travaillaient plus pour Blaxxun. Je voulais continuer à développer le Techuelife Viewer mais j’étais aussi à une étape très excitante dans le développement de Seamless3d et comme le visualiseur était principalement de technologie seamless3D ,de toute façon, j’ai décidé de développer le visualiseur par le biais du développement Seamless3d. 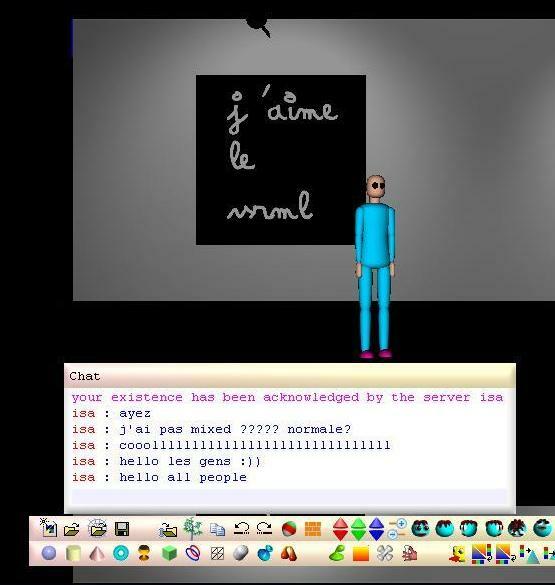 Depuis 2002, il ya eu des moments où la communauté d’origine du serveur Blaxxun a été en panne pendant des semaines et pendant ces périodes, j’ai repris le travail sur Seamless3d chat, donc il a été développé pendant toutes ces dernières années. Comme Seamless3d chat est une plate-forme open source non propriétaire, il est à l’abri de la faillite ou d’être pris en charge par une entreprise qui bloquerait son développement . - Pour toi, quelle est la meilleure alternative à Blaxxun et pourquoi? Lorsque l’on compare les plates-formes de chat 3d il faut prendre de nombreux aspects en compte. Je pense qu’il serait injuste pour moi de dire quelle est la meilleure plate-forme 3D. Je ne peux pas vraiment comparer Second Life à Blaxxun en raison de la lenteur de ma connexion par modem . Est-ce compatible avec Blaxxun ? Est-ce que ça limite la liberté artistique ? Est-ce que l’utilisateur peut y uploaderses ouevres gratuitement ? Est-ce que l’animation est fluide et sans ruptures ? Est-ce que ça plante souvent pour beaucoup de gens ? Est-ce dépendant d’un composant qui n’a pas d’avenir ? Est-ce que cela vous laisse utiliser le modeleur de votre choix? Est-ce que cela suporte la voix ? Est-ce que la plateforme est source, à la fois comme serveur and comme client ? Si c’est open source ect-ce dépendant de quelque chose qui ne l’est pas ? Si c’est open source quelle liberté la license donne -t-elle ? Est-ce que cela permet de rééditer les polygones pour les optimiser ? susceptible d’avoir le soutien d’une large gamme d’applications? ou faut-il compter seulement sur les promesses ? Je ne connais pas de plateforme qui serait la meilleure sur tous ces points.